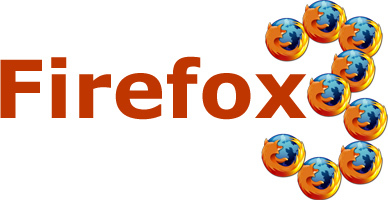 If you didn't already know, Firefox 3 has been released to the unwashed masses. If you are wondering if you should upgrade, the short answer is a resounding yes. The long answer is the rest of this blog post. A lot of people, myself included, had a few problems with Firefox 2. My two biggest problems were the memory usage of the browser and the stability of the browser. To begin with, the memory problem definitely appears to be fixed in Firefox 3. Right now I have 2 instances of Firefox open with nine tabs in one window and four in the other and Firefox is using 100Mb of RAM. Firefox 2 would have been using at least 3 times as much memory. So, I think I can safely say that the memory problem has been greatly improved. As far as stability goes, I have been having mixed results. I am using Firefox 3 on three machines. On my MacBook I've been using Firefox 3 RC2 since it was released a week or two ago and have been very happy with the experience. I have been using Firefox 3 on my home desktop computer for a couple days and it has been very stable. On my work computer, though, Firefox has crashed on me a few times. Based on my minimal experience I am going to assume that the problem resides with a conflict on my work machine and not with Firefox 3 and say that so far Firefox 3 has been very stable but only time will tell. Firefox 3 also received a few new features and a new look. I'm really liking the new look, especially on OSX. One of the new features I have noticed is that when you are closing the program it asks if you want to save the tabs. You could probably argue that this should have been a feature from the beginning of tabbed browsing, but I am glad that it has finally been added. Another neat new feature is the "smart" address bar in Firefox 3. When you type something (like transmatrix) Firefox will search through all of your bookmarks, and your browsing history to find a match to the text you entered. It also displays the site's favicon by its entry in the address bar, I really like this little touch. There's lots of other new features that you can find here. Overall, just the improved memory management of the application is worth the upgrade. So, go ahead and go here to download the latest version of Firefox. If you didn't already know, Firefox 3 has been released to the unwashed masses. If you are wondering if you should upgrade, the short answer is a resounding yes. The long answer is the rest of this blog post. A lot of people, myself included, had a few problems with Firefox 2. My two biggest problems were the memory usage of the browser and the stability of the browser. To begin with, the memory problem definitely appears to be fixed in Firefox 3. Right now I have 2 instances of Firefox open with nine tabs in one window and four in the other and Firefox is using 100Mb of RAM. Firefox 2 would have been using at least 3 times as much memory. So, I think I can safely say that the memory problem has been greatly improved. As far as stability goes, I have been having mixed results. I am using Firefox 3 on three machines. On my MacBook I've been using Firefox 3 RC2 since it was released a week or two ago and have been very happy with the experience. I have been using Firefox 3 on my home desktop computer for a couple days and it has been very stable. On my work computer, though, Firefox has crashed on me a few times. Based on my minimal experience I am going to assume that the problem resides with a conflict on my work machine and not with Firefox 3 and say that so far Firefox 3 has been very stable but only time will tell. Firefox 3 also received a few new features and a new look. I'm really liking the new look, especially on OSX. One of the new features I have noticed is that when you are closing the program it asks if you want to save the tabs. You could probably argue that this should have been a feature from the beginning of tabbed browsing, but I am glad that it has finally been added. Another neat new feature is the "smart" address bar in Firefox 3. When you type something (like transmatrix) Firefox will search through all of your bookmarks, and your browsing history to find a match to the text you entered. It also displays the site's favicon by its entry in the address bar, I really like this little touch. There's lots of other new features that you can find here. Overall, just the improved memory management of the application is worth the upgrade. So, go ahead and go here to download the latest version of Firefox.